I try to include lentils and dals twice a week in our menu either as curries,sundals or else as dal based dosas. When i saw the themes for this 20th edition of blogging marathon, i went immediately to two interesting themes for the first two weeks eventhough my themes for third and fourth weeks are also gonna be very interesting this themes.For the first week, i choosed cooking with onions and this week's theme is gonna be delicious dals, the main aim of this week's theme is to showcase a dal or lentils. My today's post, i choosed whole green grams and cooked along with snakegourd. This curry goes excellent as side dish for rotis or with a bowl of hot steaming rice and papads. Simply loved this healthy,nutritious and wholesome curry with our rotis for our dinner yesterday. Check out the other marathoners running this 20th edition of blogging marathon here. Heat oil in a kadai, fry the mustard seeds,urad dal,cumin seeds and dry red chillies until they turns brown, now add the finely chopped onions,curry leaves and ginger garlic paste,cook until raw smell goes away as well as the veggies get well cooked. Add the snakegourd to the veggies,saute for few minutes. Meanwhile grind the coconut and fennel seeds in a blender as fine paste with enough water. Add the already cooked moongdal to the veggies with cooked water, also add the pav bhaji masala,coriander powder,bring them to boil. Once the curry starts boiling,add the grounded spices to it and cook with lid closed until the snakegourd gets cooked well stir them occasionally. Put off the stove. Serve hot with rotis or rice. This curry looks so delicious..I will have to substitute snake gourd with some other vegetable because we don't get that here. Yummy curry...will try this combo..
Just had snake gourd curry with coconut. Wish I had seen this earlier. Always want to make something different with some of these veggies. Next time. Bookmarking for now. love the combo Priya. healthy one. Mom often makes this simple curry with peerkangai...love it.Can I jump in for dinner? I usually make snake gourd curd chutney/raita and snake gourd dal. Now I have one more recipe to try with this vegetable. Thanks for the recipe. Healthy curry..I have never tried this combo..loved this..
Nice variation, using pav bhaji masala is new to me. Priya I am bookmarking this. The girls will love it because it has pav bhaji masala but i as it get veggies in them. Nice one. I am sure its tastes great with rotis and with rice too. looks amazing Priya...nice way to cook snakegourd, its something new to me. Bookmarking it. i love this combo, comfort meal with rice...loved your version too!! Priya I ike the way u mix and match the spices..lovey dish..let me tell u we have fallen for u r tindli recipe with sambar pwd..its a must ..every week. 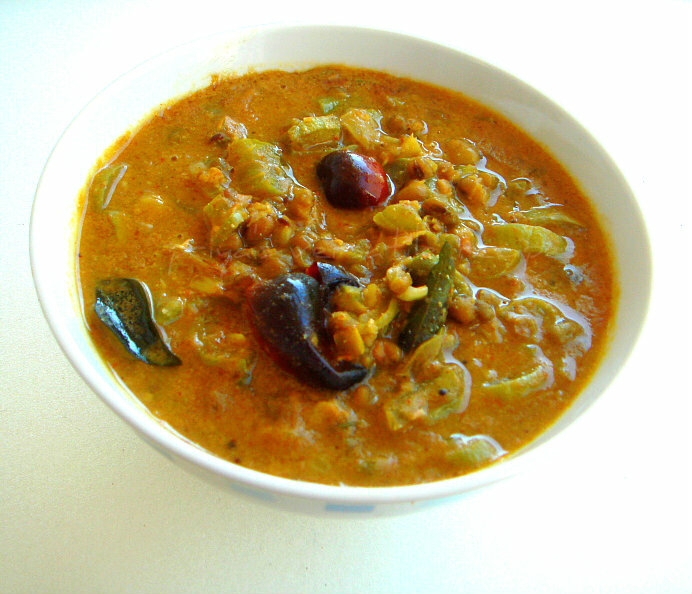 Healthy , delicious and flavorful.. Love it..
we make this dal with lauki. will try zucchini and update you. We make kootu with snake guard , moong dhal and cocnut. Nest time will try your version. sounds yum.